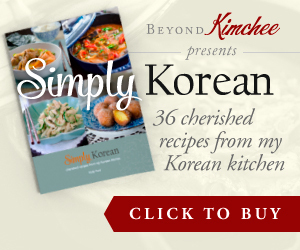 Some Korean dishes have a sad history behind. 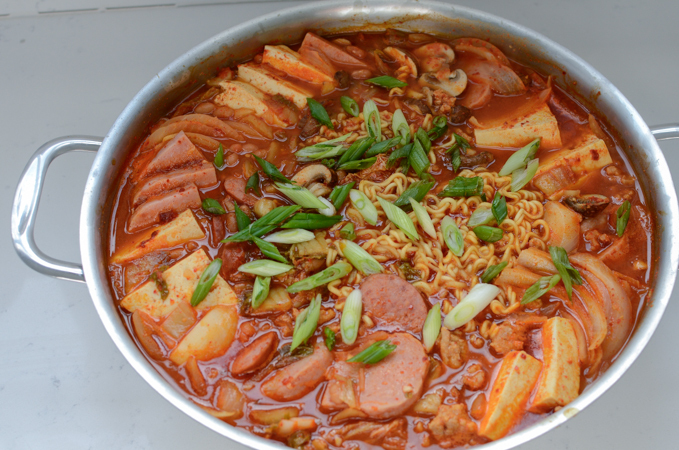 This spicy looking stew called Korean army stew, aka “budae jjigae (부대찌개)”, is one them. During and after the Korean war in the early 50’s, Korea was known for the world’s poorest country. Millions of civilians were killed, orphans were wondering on every street, farmlands and the roads were destroyed, majority of Korean people suffered with lack of food and medicine. Many had to scavenge for anything that they can eat. People had to depend on relief aid from the UN and other nations. 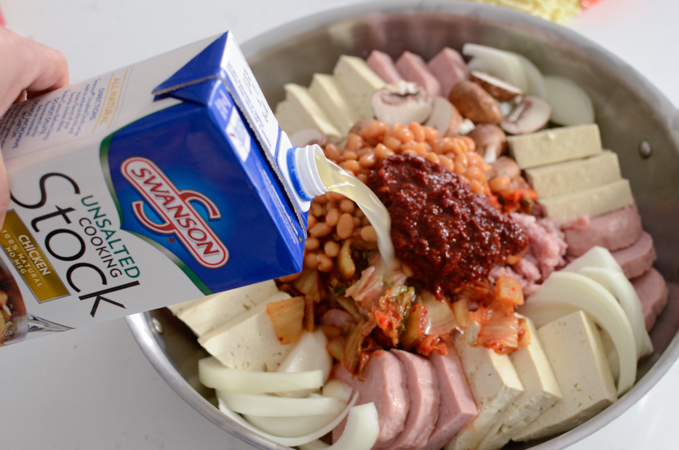 Korean army stew is made with various canned foods that came from the U.S military base in Korea. Typically they were the cans of Spam, pork and beans, and Vienna sausages (or hot dogs). They offered valuable animal protein which were so lacking among Koreans at those difficult time. They mixed the American canned food with local Korean flavor and made into very unique dish of on its own. 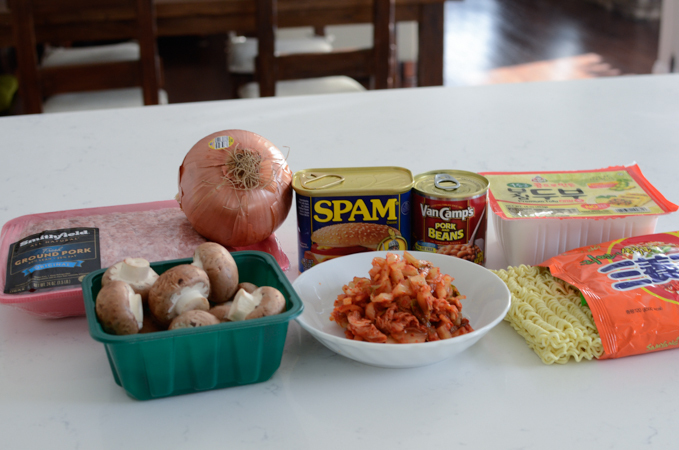 Perhaps Korean army stew would be the very first Korean-American fusion dish. To be honest, I never tried this stew until I was in my 20’s. After the war was over, situation had improved and Korea became prosperous again in a very short period of time. 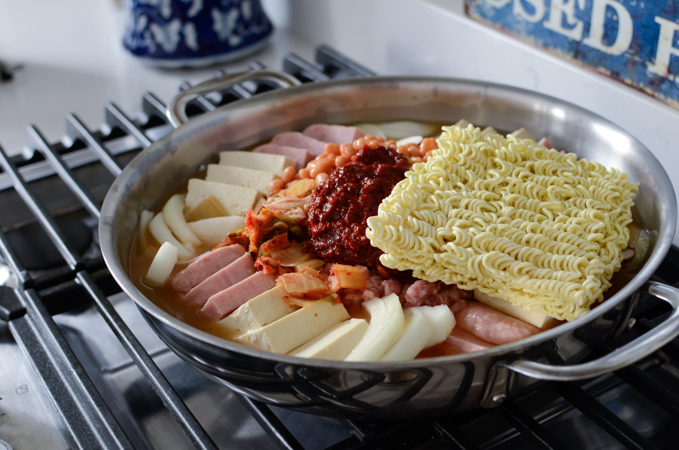 “Budae jjigae” had been somewhat forgotten until decades later. People began to crave for this army stew again. The stew brought a nostalgia and reminded what the life was like in those days after the war. Although this stew might not be so appetizing to look at, it is actually very tasty. 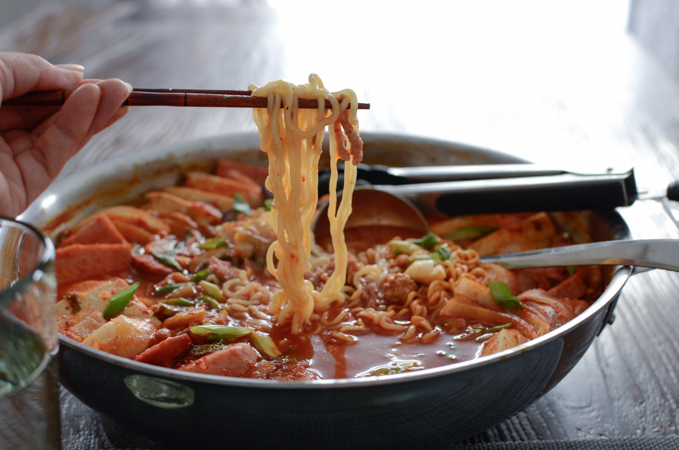 In fact, Anthony Bourdain, the famous cook and TV personality on Food TV, has shared this Korean army stew with Andre Cooper’s on CNN’s Parts Unknown. The recipe is very simple and quick to put together. Here are what I used for my army stew. 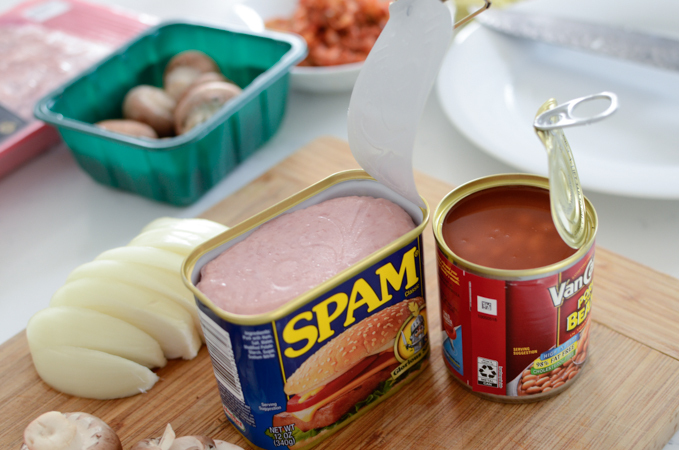 Spam and pork and beans are the must for this recipe. 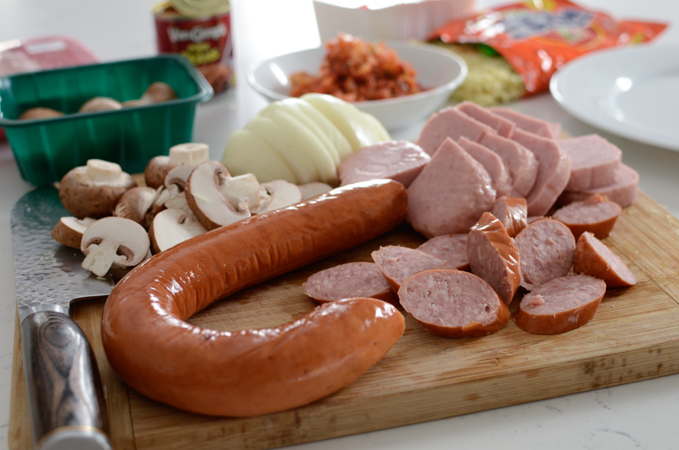 I also added Polish Kielbasa sausage. You can use hot dogs or other types of sausage instead. I added 1/2 of seasoning powder of Korean ramen. 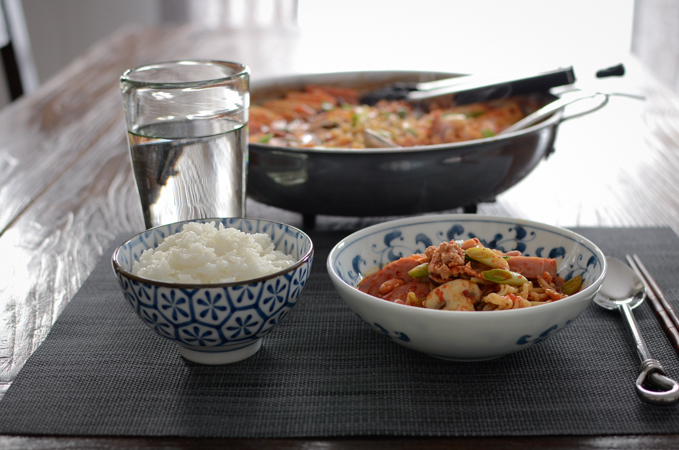 This can mimic the flavor of restaurant style budae jjigae. Assemble together in a large shallow pan, and pour chicken stock. Make sure to use unsalted or low sodium stock. Add a ramen noodle on top and bring the whole thing to a boil. Ramen noodle is an optional. If you don’t want it, you can omit it. Once it starts to boil, mix the seasoning around. It only takes a few minutes to cook. When ramen noodle gets soft and chewy (but not soggy), the stew is ready to serve. Try to eat the noodles fast before they get soggy in the soup. I served my stew with a little bit of rice to soak up all the great broth that comes from the “meat”. Delicious! It is spicy so be aware. 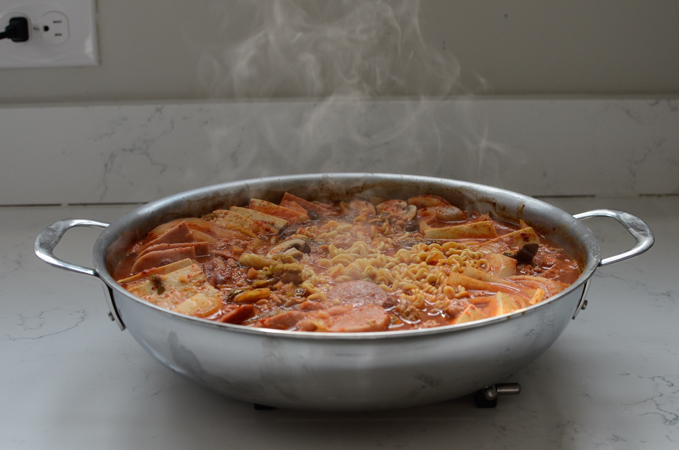 Budae jjigae is a great to share with family and friends when you crave something spicy but with very little amount of preparation and the cooking time. I had a great lunch myself. It was filling and comforting. Although I was born much after the war and never had to gone through the harsh time like my parent’s generation did, I felt humble and grateful for all the abundance and comfort I am taking for granted as I was enjoying this amazing stew. With this recipe, I would like to show my gratitude to all those who are serving the country to provide our liberty and safety both in Korea and U.S, or anywhere else in the world. Without their sacrifice and devotion, we wouldn’t be able to live our lives they way we are now. Thank you. 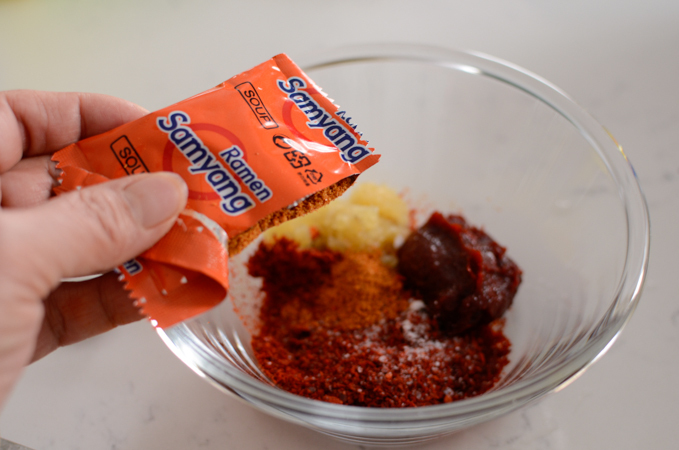 In a small mixing bowl, combine all the seasoning paste and mix well. Set aside. In a large shallow pot or pan, arrange all the stew ingredients as you please. Put the ramen noodle on top. Add the seasoning paste to the pot and pour the chicken stock over. Bring the pan to the med-high heat and let it boil. When it starts to boil, spread the seasoning paste around the pan. Untangle the ramen noodle to cook through in a broth. Cook until the pork is fully cooked, and the ramen noodle is tender yet firm. This is an amazing Stew Holly, I've cooked it countless times at it is always so comforting. Thanks for sharing your version! Hope you are doing well. 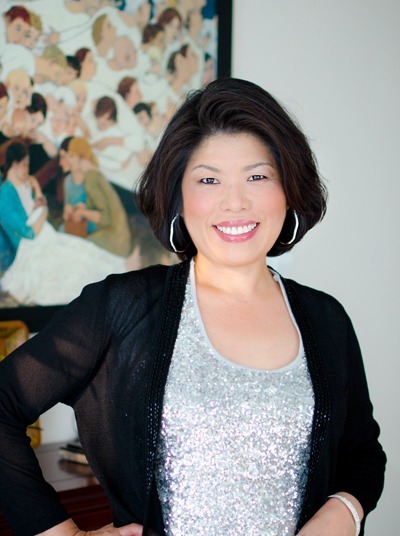 Thank you for sharing this recipe and for sharing the history and meaning behind it. My step-grandfather served with the US Army in Korea and he never understand why I had such admiration for Korea. He never saw the vibrant and prosperous South Korea that I visited, all that he remembered was the suffering and privation of the Korean people as you describe above. It pained him for years to remember the hunger that he saw. My mother cooked recipes from the Depression and from the rationing years of WWII that she learned from her mother. And I cook them too and explain to my children where they come from. On a lighter note, I love natural "fusion" recipes like this. Sharing, adapting, and finding something new - I think this is why we all meet on blogs like this! Tamar, what a sweet story that is? It is so nice that you were able to hear from your grandfather about the Korean war and what he experienced. I also had my grandmother-in law who grew up in depression time and helped raising 8 brothers. She was one of the most frugal person I have encountered. I learned a lot about being thrifty and frugal. We live in time of abundance and often forget about tough time that previous generation had gone through. A lot of lessons to learn for us.